Many of you will have seen my retail column in the Bdaily last week, where I discussed some of the key ingredients that help to make a successful independent retailer. One of those ingredients is the outside of your shop – and making a great first impression through eyecatching window displays and good-quality signage. The examples I cited in my article – Who-ray! and Chocs Away – were both in Stockton, and winners in the borough’s inaugural Town Centre Business Awards. However, I was pleased to hear from my friend, Jennifer Mullan, about a North East-influenced indie retailer that’s in a rather more far-flung location – Moraira, on Spain’s Costa Blanca. Based in Whitley Bay, Jennifer runs a business called Jenius Image and Design, combining her talent as a designer of fashions and accessories with logo and graphic design work. 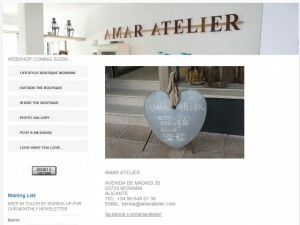 Now, one of her logo projects has turned into an actual shop – Amar Atelier. 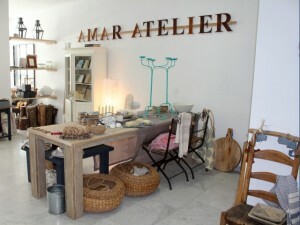 Jennifer explained to me that Amar Atelier is a ‘lifestyle boutique’ selling gifts and homewares, and is the brainchild of Amanda Kingman, a British woman who has recently moved to Spain. Amanda had previously been selling gifts and accessories through her website, Coasting Along, and decided to branch out into high-street retail. Sensibly, Amar Atelier seems to be capitalising upon this background to build a multichannel presence, with its website promising a ‘webshop coming soon’; managed well, this will help to build awareness of the physical store, as well as being an important sales channel in its own right. In the meantime, the site is quite a simple affair, but it includes the core information that I flagged as crucial in my August 2009 blog about retailers’ websites: namely, the times that the shop is open; where to find it; and how to make contact. Good quality images are also effective in conveying the look and feel of the shop, and giving a flavour of the products. “Amanda approached me via my website, after seeing my business and website link on the Mr Site newsletter, and asked me to do the logo for the shop. A lot of my work is done remotely, and it is possible to send the relevant files via email, so location is not limited. “Amanda already had the name, and some rough ideas about what she wanted, so she gave me a brief including font ideas, colour schemes and photos of the empty shop. “I took it from there and came up with some ideas. After narrowing it down to the final logo, Amanda got a local tradesman to apply the logo to the awning and the shop window. The logo also appears on swing tags, business cards and other stationery. Sadly, my blogging budget doesn’t stretch to visiting the Costa Blanca, but I do like the look of Amar Atelier as a shop, with its interesting products and creative merchandising. Furthermore, the visual identity that Jennifer has created for it is simple and elegant, yet slightly quirky – and completely in keeping with the store’s personality. 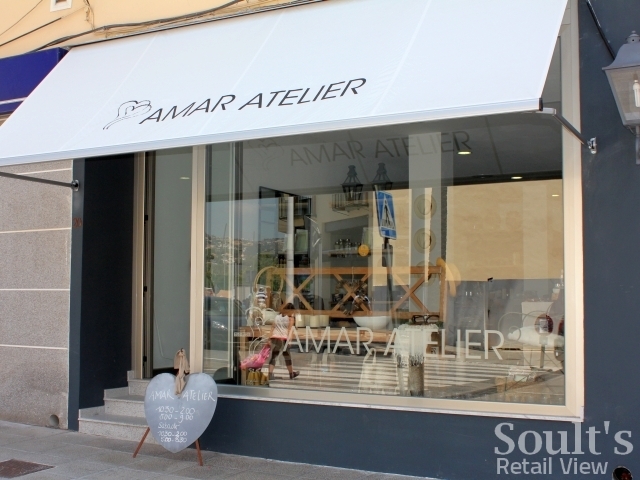 Hopefully in time the logo will appear more prominently on the shop’s website too, to more explicitly connect the different parts of Amar Atelier’s fledgling multichannel offer.